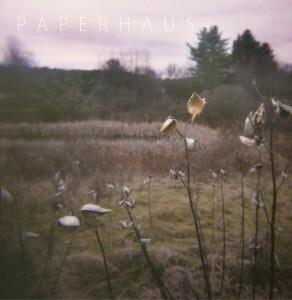 The four songwriters that make up Washington D.C.-based Paperhaus come from wildly disparate musical backgrounds (everything from blues to prog-pop), so pulling off a perfect indie pop EP was probably a piece of cake for a band that otherwise plays “psychedelic blues funk.” Lo Hi Lo isn’t a funky party record — there’s less of the swagger and none of the country from their 2011 release, while their musicianship has vastly improved — but the generous slathering of reverb and phaser on the guitar keep the psychedelia intact. Above all, it’s a comfortable, fun recording; pop precision with an eye toward melding the absurd with the earnest. The nonsensical chorus in “Corazon” (with falsetto repetition of “meet me! meet me!” sounding a bit like the Looney Tunes Roadrunner) is delivered with the same sincerity as lines like “We fell in love again / I saw the world and it was beautiful” in “Helicopters.” “Twisted Tumbled,” the closer to the EP, shifts between a pretty guitar theme, fuzzed-out riffage, and dreamy harmony vocals. The song doesn’t waste a single second of its seven-minute running length — something we could say about the EP as a whole. Pick Lo Hi Lo up; it’s a no-brainer.